They are very responsible, well mannered, very polite. Just good, but they had high integrity with everything they did for us, (Project: Asphalt Shingle Roofing – Install or Replace). Fast, friendly, professional customer service and scheduling. We called them on a Thursday afternoon and they were here on Friday morning. Their written bid was concise, detailed and easy to understand even for a roofing novice like me, (Project: Repair a Flat, Foam or Single Ply Roof). Nick explained the work very well and gave us a couple of options on what he could do. He was very prompt with getting us a contract and setting a date once we decided to go forward, (Project: Repair an Asphalt Shingle Roof). I had a water leak around a skylight. These guys came out as scheduled, and advised me to just apply some silicone sealant at the corners of the flashing. It worked great, and they didn’t even charge me anything. I’ll definitely call them again if I ever have roofing problems, (Project: Repair a Wood Shake or Composite Roof). Very professional. Prompt response, thorough repair, (Project: Repair a Tile Roof). 101 Roofing did a great job on my complete new roof. I would recommend them to anyone. Great value for my money as well, (Project: Repair an Asphalt Shingle Roof). Have already recommended, will call them back if needed, (Project: Repair a Tile Roof). The work was performed as agreed upon. What I could see from my vantage point (ground level) I have no complaints about workmanship, (Project: Repair a Tile Roof). No comment, (Project: Repair a Tile Roof). I haven’t given a fair rating to work quality because we won’t know that until the first rain storm. I feel safe in saying that if there are any issues, they’ll be taken care of. Response to our request for work was prompt, efficient and personable. Price was more than fair, the work site was left in a neat condition and any questions we had– both before and after the work– were always responded to in a professional, courteous and thorough manner, (Project: Repair a Tile Roof). Friendly and told me that there was only a leak in a loose fitting around the smoke stack which a fixed at no charge, (Project: Repair a Flat, Foam or Single Ply Roof). I had to wait for rain to submit a rating, (Project: Repair an Asphalt Shingle Roof). My husband and I were very pleased with the job 101 Roofing & Construction did on our roof. We appreciated the quality of the product, workmanship, and dedication service we received. Getting our roof ahead of schedule relieved a lot of concern. Planning to make positive remarks about 101 Roofing & Construction on yelp.com so others can see you guys are a stand up company. Would recommend to anyone needing roofing repairs or replacement. We were very happy with the work. Employees were prompt, worked hard, and did a professional job. We would be happy to act as a reference. Thanks. Everything was done very well! Foreman was excellent! Your workers were both effecient and courtious! Thanks! Thanks very much for promptly performing the roof replacement work on my 2 car garage. The first day preparation team with Nick Ciari did an excellent job of replacing the damaged redwood roof edging so that it looked identical to the original construction. The second day roofng installation team with Juan was efficient and professional in their work, producing a very nice looking roof exactly as shown in the literature. I am confident that this will solve our leak problems for many years to come, and the heat insulation will be a welcome additional benefit. We had an emergency situation, rain coming in in buckets. We were scheduled and completed almost immediately! I was very happy with everything and very relieved to have the roof fixed so quickly. You all did a fantastic job. You guys were very punctual for each visit. I was very happy with the way the project was managed. Nick Ciari and Juan were a pleasure to work with. I was very impressed with your service and would highly recommend your company to others. I will contact you when I need painting, exterior and interior. 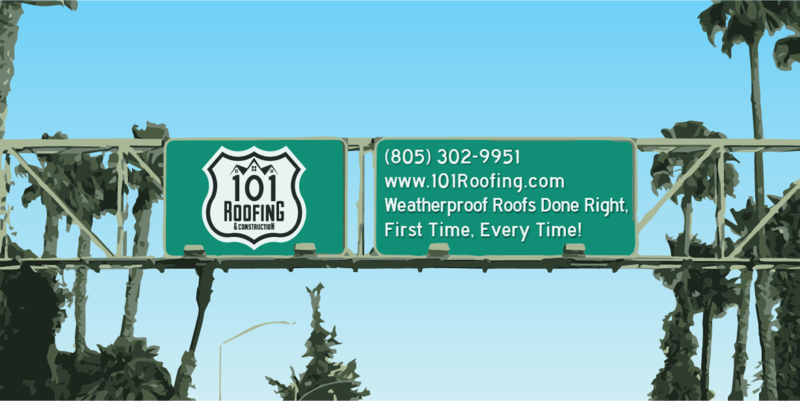 I wish 101 Roofing & Construction could provide all my home maintenance. I would enjoy working with you guys for all my home maintenance needs.